A round of scattered t-storms will likely develop this evening in parts of North Texas. Any storms that form could become severe with large hail and damaging winds the main threats. Today will be very spring-like! Most of the day will be dry, warm, and breezy. 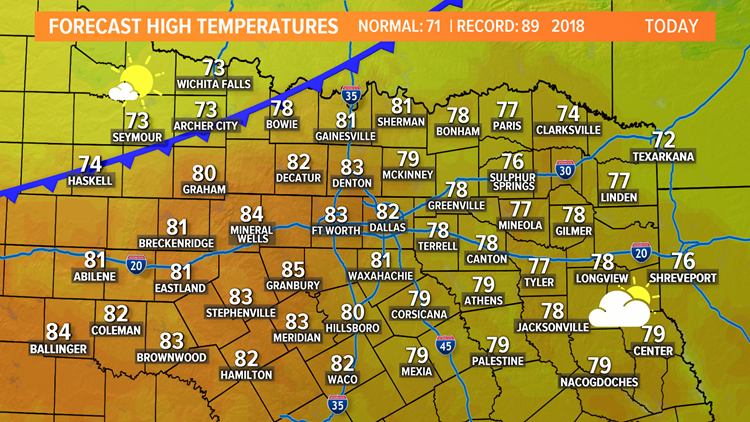 In fact, highs today will likely reach 80° or above. This will make for the warmest day so far this year, and perhaps the warmest day since late October last year! However, t-storms are still in the forecast this evening and into tonight. A "cap" will be in place most of today, which will keep things dry until this evening. 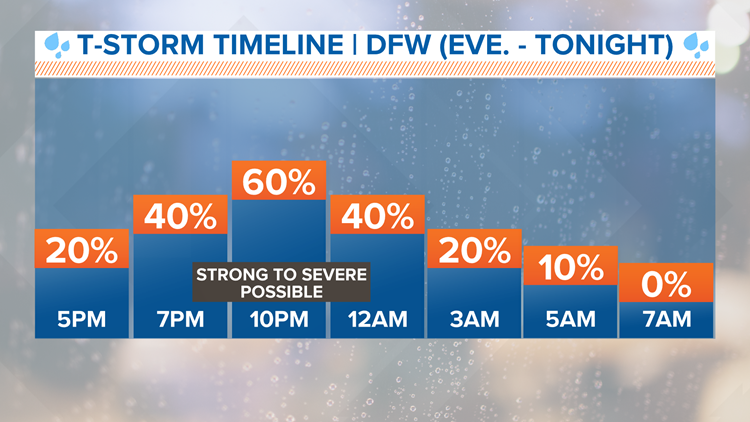 By 6pm to 7pm, t-storms will start to form mainly across northeast North Texas. These will slowly drift south, and additional storms will form as well. These storms will carry a risk of becoming strong to severe with hail and wind the main threats. Scattered t-storms will be possible from around 7pm to midnight give or take. Any t-storms that form will be capable of becoming strong to severe. Not everyone will see storms this evening into tonight. Any storms will move out through the late night hours with a dry start to Monday. While any storms that form this evening and tonight will be capable of becoming strong to severe, not everyone will see severe storms. Isolated storms are possible for those in the "Marginal" risk area, and scattered storms are possible for those in the "Slight" risk area. 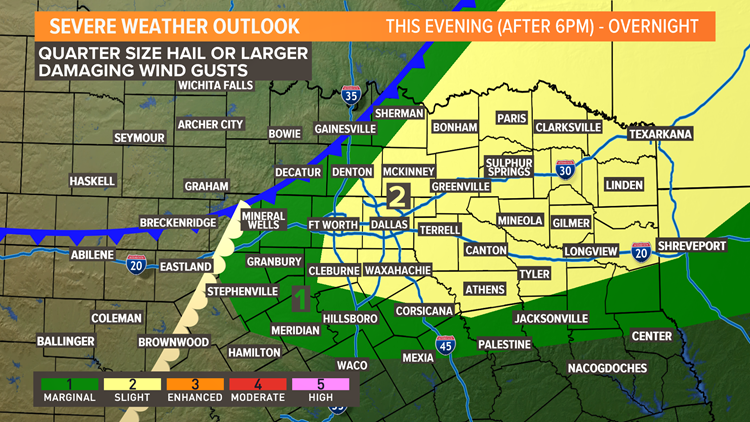 Main threats with any severe storms are large hail and damaging winds. Hail of quarter size or larger is possible, perhaps up to golf ball size. Wind gusts could top 60mph, which is strong enough to be damaging. While this time of year the tornado threat is rarely zero, the tornado threat is low. I'm much more concerned with hail and strong winds. Any storms will move south and east overnight with a dry forecast by Monday morning for most. Monday will feature clearing skies, breezy winds, and a little cooler temps.